A visualization of NASA’s Lunar Reconnaissance Orbiter passing low over the moon¹s surface near the lunar south pole. A NASA probe has dipped closer to the moon than ever before, perhaps setting the stage for a new round of discoveries about Earth's nearest neighbor. "We're taking LRO closer to the moon than we've ever done before, but the maneuver is similar to all other station-keeping maneuvers, so the mission operations team knows exactly what to do," Steve Odendahl, LRO mission manager from NASA's Goddard Space Flight Center in Greenbelt, Maryland, said in a statement. 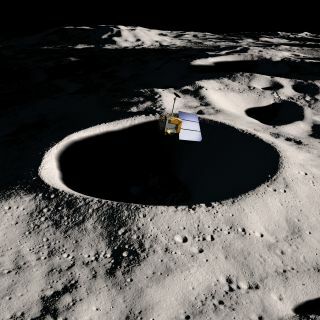 Lowering LRO's orbit essentially magnifies the sensitivity of LRO's six science instruments, giving scientists a chance to learn more about how water and other compounds could be trapped at the moon's poles, said LRO project scientist John Keller, also of NASA Goddard. "The lunar poles are still places of mystery where the inside of some craters never see direct sunlight and the coldest temperatures in the solar system have been recorded," Keller said in the same statement. Two instruments aboard LRO should especially benefit from the orbit change, scientists said — the Lunar Orbiter Laser Altimeter (LOLA), which builds a topographical map of the moon's surface, and the Diviner Lunar Radiometer Experiment, which maps the moon's temperature. Getting closer to the surface allows LOLA's lasers to return a stronger signal that can lead to more detailed measurements of the geography at the moon's north and south poles. LRO's orbit change should also allow Diviner to record smaller features of the moon with higher resolution data of lunar temperature changes from day to night. Enhanced data from Diviner may provide more evidence of ice and water on the moon. Such information could help NASA and other organizations better plan out future human missions to the moon.